I would like to see greater attempts at unified worlds. Whilst the repetition of the Ishimura did annoy me at times it had enough narrative justification to be acceptable for me. In order to reduce this reaction I don't think that the repetition need to be removed but a focus should be put on removing the sterility of those environments. The one possibility might be through the inclusion incidental interactive elements as a means of fleshing out the world and making a realistically, if repetitive, environment feel more justified. I really would like to see the tight gameplay of a game like Dead Space in a world that is just as believable as in Red Dead Redemption, just not as expansive. I don't believe this is case for all games but I was repeatedly rewarded for having completed the original game during my time in Dead Space 2. Not only does it do what all good sequels should, which is iron out the gameplay mechanics, but it alludes to very specific story beats from the original. Dead Space 2 provides joy in the act of recognition of characters and themes from the original. You should keep a list of all the discussion points from this podcast because I reckon everything you touched on, mechanical and thematic, was tackled some degree in the sequel. For this reason alone you guys should consider fast tracking the Dead Space 2 play session, I think you will be pleasantly surprised. I generally agree with your comment. The monotony of the environments got to me pretty bad. I do think its a combination of both sterility and repetition that is problematic though. Sterility is a hallmark of science-fiction, so it has its place. Frankly, I was really surprised they didn't use the organic presence of the necromorphs to greater environmental effect. Also, I'm half way through 'Dead Space 2' and I am very eager to talk about it. I didn't find the sterility of the corridors in Dead Space boring or monotonous at all really. It made sense to me. The Ishimura is an industrial ship. Anyone who has ever worked in a factory knows that pretty sights and variation are hard to come by. I had the exact opposite reaction to the organic effects in the environment... the more overgrown with organic mush the environments became, the more I wished there was less of it. I think the reason is because the organic look detracted from the "I'm on a spaceship in space" feel of it for me. I've actually had mixed feelings about some of the environments in Dead Space 2 for the same reason. Maybe I'm just too biased toward the first installment (which I absolutely like better so far), but the first Dead Space and Isaac's physical appearance are very gritty and metallic. That is Dead Space's core appearance in my mind. So when I find myself in colorful rooms full of pink baby cribs and hanging mobiles... 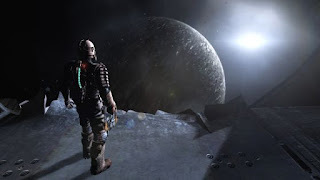 I understand why it's all there narratively speaking, but it also feels a little out of place as far as what Dead Space means to me (i.e., woefully alone and terrified in the harsh isolation of SPACE). I'm enjoying Dead Space 2 as a game in itself, but I think it has lost more than a little of what made the first Dead Space so spectacular, seemingly in favor of more grueling action and more frequent gore.